"I bet that'd look good over there. And this over here!" And you know what, you're probably right. You have it in your blood to be an interior designer. ...why not get paid for it! You're just doing what comes natural. Being an Interior Designer can be well worth your time - and yes I am talking money. How would you like to work for yourself doing something that you enjoy? "How to Start Your own Interior Designing Business"
If you are interested in Interior Design, you can start your own career with just a little guidance. Has anyone ever told you that you have an eye for design? The last time you helped someone move, did people ask your opinion when trying to situate furniture? Maybe you just enjoy rearranging and decorating rooms in your head. All the same... if you have the itch, or even an interest, you have already taken the first step to becoming an Interior Designer. 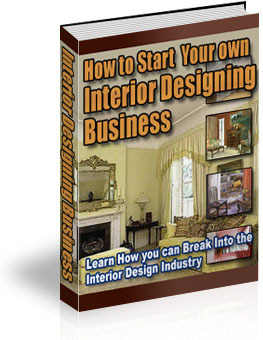 But in "How to Start Your own Interior Designing Business," you will find out how you can do exactly that. "Secrets of Tackling the Interior Design Industry Revealed Here!" "How to Start Your own Interior Designing Business" is a thoroughly researched report on how to take your interest and turn it into a full fledged career. It takes you from the beginning - helping you figure out if this is really for you - all the way to finding clientele for your new business. "Who Else Wants to Break On Into The Interior Design Industry!" If you want to know if Interior Design is for you, then this is the report you must have. Once and for all you can find out exactly what being an Interior Designer means. All you have to do is start reading on page 5. Not sure if you have the passion? Pages 26, 27, and 28 will let you know for certain. With "How to Start Your own Interior Designing Business," there will be no surprises. Find out what college courses to expect, or what to do to teach yourself the art! "If You Decide Interior Design Is For You, We'll Show You How To Get Started!" Once you're ready to start looking for clients, this report will teach you how to start searching for them. Many people start new businesses. But the truth is, most of them fail within the first couple of years. But how many of them had a GUIDELINE to show them what to do each step of the way. Most likely VERY little. You can take this information and use it to your advantage. If you knew that you could be on your way to a brand new career working for yourself... would you take it? "How to Start Your own Interior Designing Business," could be your ticket. If you knew that this one single report could be responsible for your income for the rest of your working days... what would it be worth to you? A year's worth of wages? How about less than ONE day's wages? $37.77 will get you the report that will tell you all you need to know to BREAK into the Interior Design Industry. And that's why we couldn't call it by any other name. "...90 Day Money Back Guarantee!" I am 100% certain about one thing. I am so certain that "How to Start Your own Interior Designing Business" will be so helpful to you, that I'd be willing to refund 100% of your money at any time within 90 days if you ask for it. That's for ANY reason. I'm not saying if you have problems receiving or reading the eBook that I'll refund your money. I'm saying that even if you just do not LIKE the eBook, I will refund your money. If it's not what you thought it would be, then you get your money back. That's a 90-Day Money Back Guarantee with no fine print and no strings attached. It's easy to order "How to Start Your own Interior Designing Business." Just click the order button below and you'll be walked through the process. Order "How to Start Your own Interior Designing Business" Now! P.S. "How To Break Into The Interior Design Industry!" is a no-holds-barred look at how to take your talent and make it into your own promising career. You love decorating in your own home - why not get PAID to do it elsewhere! Now you can, and this report will show you how. P.P.S. IF IT SOUNDS TO GOOD TO BE TRUE - don't worry. Because if you don't feel that "How To Break Into The Interior Design Industry" was worth your time. All you need to do is write for a refund. And you can do that at anytime within 90 days for any reason at all. I'm so confident that you will love this report, that I'm willing to take all the risk on me.